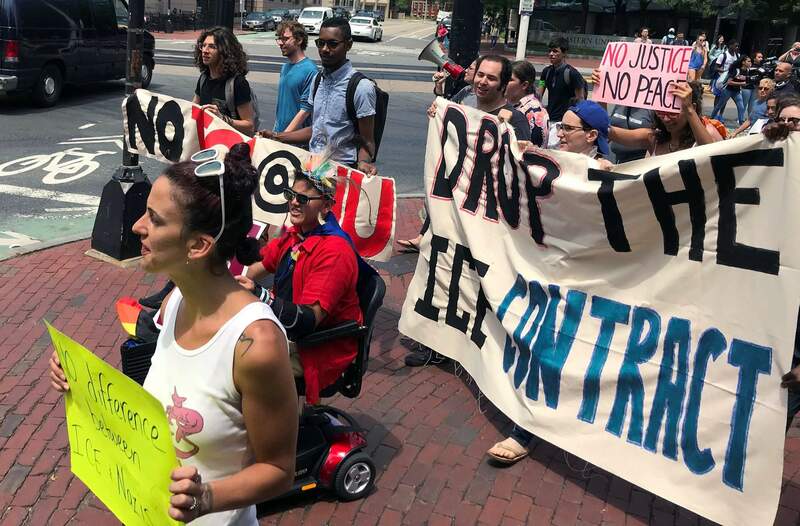 Students and community activists rally July 11 at Northeastern University in Boston demanding the school cancel a multimillion-dollar research contract with U.S. Immigration and Customs Enforcement. Northeastern was hired by ICE to research U.S. technology exports. Several colleges with ties to ICE are being pressured to split with the agency amid uproar over the separation of migrant families along the nation’s border. Some colleges are being pressured to cut ties with U.S. Immigration and Customs Enforcement amid public outcries over the separation of migrant families along the nation’s southern border. Northeastern University, Johns Hopkins University and Vermont’s system of public colleges have contracts with ICE totaling about $4 million this year for research and training services. The schools argue that their work has nothing to do with ICE’s role along the border, but some on campus say the agency’s actions clash with school values and that preserving any relationship amounts to a tacit endorsement. Some students and faculty have been circulating petitions and organizing protests over the contracts. The protesters have singled out ICE as the face of the administration’s policy, even though the agency said it had no role in the separation of families. Officials at ICE declined to comment on the protests, but spokesman Matthew Bourke said the policy was created by the Justice Department and enforced by U.S. Customs and Border Protection, a separate agency under the Department of Homeland Security. Students and community activists march July 11 at Northeastern University in Boston demanding the school cancel a multimillion-dollar research contract with U.S. Immigration and Customs Enforcement. Northeastern was hired by ICE to research U.S. technology exports. Several colleges with ties to ICE are being pressured to split with the agency amid uproar over the separation of migrant families along the nation’s border. The schools facing backlash are among at least six currently contracted by ICE, and at least 20 that have worked with the agency in the past, according to federal spending data. Their work has ranged from counterterrorism training and evidence testing to leases for campus parking spots. Activists across the country decried the forced separation of children under the Trump administration’s “zero tolerance” policy toward those who illegally cross the border. The administration says “under 3,000” children had been separated from their families before it stopped the practice. Relatively few of the agency’s contracts go to colleges, with far more going to businesses including Motorola and Deloitte, where some employees have also called for a break with the agency. Over the last decade, colleges have received roughly $11.5 million from ICE, compared to $12 billion that went to businesses, according to federal data. Johns Hopkins, which has received $6.5 million from ICE, partners to provide leadership training and medical instruction to agency employees. Part of that has included $1 million used to send ICE officials to Gettysburg National Battleground for leadership “staff rides” led by Hopkins experts. Borrowed from the military, the staff rides are a type of exercise meant to teach leadership by analyzing key decision made in battle. Dennis O’Shea, a spokesman for Hopkins, said the agreements with ICE are part of the university’s broader effort to provide training to several federal agencies. He declined to comment on the petition against ICE, saying officials have not yet received it. 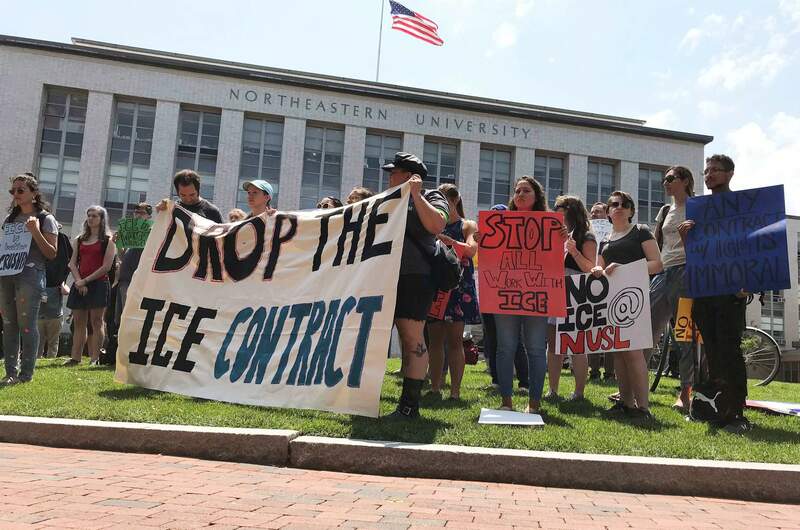 At Northeastern University in Boston, protesters gathered on campus this month calling for an immediate end to the school’s ICE contract. The $2.7 million deal supports a research project studying U.S. technology exports that could help terrorists or other criminals abroad. The criminologist leading the project, Glenn Pierce, said it ends this year and won’t be renewed by ICE. Still, school officials defended the work and rebuffed the idea of turning down research funding. The Vermont State Colleges System received about $34,000 from ICE this year for leadership and financial accounting training attended by ICE staff at Vermont Technical College. Amanda Chaulk, a spokeswoman for the school, said the programs are not related to policing or enforcement and that the school has not been asked to provide any additional training. But some students in the system were nonetheless angered by the tie. Mackenzie Murdoch, a sophomore at Northern Vermont University, is circulating a petition urging administrators to sever all ties with the agency, which Murdoch describes as immoral. “We’ve seen what ICE is doing, and it does not uphold the same values that Northern Vermont University is claiming,” said Murdoch, 18, of Bow, New Hampshire. Others that contracted with ICE this year include the University of Maryland, which provided hazmat training, Virginia Tech, which was hired to test aluminum confiscated by ICE at a port of entry, and the University of Alabama at Birmingham, which says it worked with the agency to prevent harmful drugs from being smuggled into the country. All three contracts expire this year.